The big news story of the week has been that of a record being broken by... can you guess who? Her Majesty the Queen? Gord bless her. Dear me no. Wean Rooney? I should coco. The record has nothing to do with being stuck on the throne longer than anyone ever before, or scoring more goals in meaningless internationals than anyone else. Step forward Fabian Delph, but only for nine seconds thanks to a hamstring injury forcing him to be substituted at the very start of Tuesday’s England vs Switzerland game. Thus, he has inadvertantly entered the record book as making the shortest ever appearance by an England starter. There has been a lot of talk lately about farmers not being paid enough for the milk they, or rather, their cows, produce. Farmers are perceived as being rather a grumpy breed who, basically, moan about everything - not enough being paid for meat, subsidies not high enough, weather being a bit rubbish - that sort of thing. If it is possible to grumble about something, they will do it. And so it is with milk. Apparently they receive just 26 pence per litre of milk they sell to the supermarkets. Scandalous isn’t it? Cheap as chips Adli are currently selling a two litre carton of milk for 73 pence. That is the cheapest price I have seen. Why are supermarkets so intent on selling milk this cheaply. Twenty years ago [Here we go, Hovis time. - Ed.] my local shop was selling milk at 99 pence per two litre carton and that was the cheapest price around at that time; some shops were selling the same product for £1.69. Twenty years ago! No wonder the farmers are so angry. I can recall when we used to have milk delivered to the house every morning, it cost almost a shilling per pint. That was when that well-known gauge for inflation - the Mars bar - cost 6 old pennies, or just over half the cost of a pint of milk. Inflation being what it is, you can pay anything between 50 and 80 pence for a Mars bar these days. If milk prices had risen at the same rate of inflation, a pint should now be costing between 90 pence and £1.50. Per pint! Those two litre cartons, by my (admittedly poor) reckoning, should now be priced at somewhere between £3.15 and £5.25. For once, I think the farmers have a perfect right to be just the tiniest bit miffed. All this talk of milk reminds me of the Billy Connolly question - Who was the first person to milk a cow and what on earth was he thinking? I have a similar question - Why do we, as a species, drink milk produced by another species? All mammals require mothers’ milk from birth until they can move onto other food. It’s called weaning. Why do humans, not only feel the need to continue feeding on milk, but decide to switch from human milk to that of cattle, sheep, goats, or whatever? Don't think too much about it though, because that is really a pretty weird concept. I recall a story from not so long ago about a restaurant which tried to sell products made with only human milk. Guess what. They were forced to close because of the protests. I am sure somebody used the expression, 'It's not natural'. Excuse me? It's a bit more natural than drinking the milk of other species, I would have thought. Another question. Who first realised that milk which had become pretty much rancid and had started to become solid could still be eaten? Would anyone actually eat cheese if they fully considered the way it is made? Here is a short extract from an article describing the process. Starter cultures (What? ), or good bacteria (Bacteria? The stuff we use Domestos to kill? And how do you know they are good? ), are added to start the cheesemaking process. They help determine the ultimate flavour and texture of the cheese (Clever little sods, these bacteria, aren’t they?). Next, a milk-clotting enzyme called rennet - a complex of enzymes produced in the stomachs of ruminant mammals (I think I’m going to be sick) - is added to coagulate (BLEUCHHH! Sorry about that.) the milk, forming a custard-like mass (I’m going to be sick again. Time to become vegan, I think.). Any birthdays to celebrate this Saturday, the 12th of September? Why, yes. Loads. Richard Gatling 1818 (Inventor of the joke - Do you like Gatling? I don’t know, I’ve never Gatled. I never said it was funny. ), Herbert Asquith 1852 (Star of ‘The Confessions of a Prime Minister’. ), Maurice Chevalier 1888 (Thank heavens for little girls? It’s a wonder there isn’t a police investigation. I’m just saying. ), Jesse Owens 1913 (Runny jumpy bloke), Ian Holm 1931 (And he lived happily ever after... to the end of his days. ), Patrick Mower 1940 (Irish grasscutter), Maria Muldaur 1943 (Send your camel to bed? What? ), Barry White 1944 (The walrus of luuurve. ), Neil Peart 1952 (Why the hurry? ), Brian Robertson 1956 (Whisky in the jar oh.) and Ben Folds 1966 (Whatever and ever, amen.). Now, who amongst that lot could provide us with a toon to gramblerise? The man who always began a song as if he was being slowly wound up, Barry White? No. Brian Robertson played with Thin Lizzy - stop sniggering at the back - how about something from them? Yes, but not Grambling in the jar oh. How about this one? Blackpool recorded their first victory since January with a narrow away win at Scunthorpe. The Seasiders had gone 24 matches without a victory in all competitions but Brad Potts bundled in before the break to give them all three points at Glanford Park. It gave Neil McDonald's side a first win away from Bloomfield Road since a 2-0 victory at Wigan in April 2014. The Cobblers took the lead on 23 minutes when Marc Richards headed home Nicky Adams' enticing cross. Matt McClure levelled five minutes later when he headed in Ashley Hemmings' cross at the back post. A mix-up between Rod McDonald and keeper Adam Smith allowed McClure to tap into an empty net before half-time. Smith almost single-handedly kept the home side in the game after the break as he denied Christian Doidge and Hemmings. First-half goals from Sean Kelly and Steven Thompson gave St Mirren their first win of the Championship season as they beat Queen of the South. Kelly was quickest to react after Thompson headed Stephen Mallan's corner into the six-yard box. Thompson squandered a fine chance before doubling Ian Murray's side's lead after out-muscling his marker. Lee Wallace established an early advantage from a well-worked free-kick, with James Tavernier adding a second just before half-time when he latched onto Nathan Oduwa's flick. The comprehensive victory was secured through Barrie McKay's effort from close range. And Martyn Waghorn increased the advantage with two penalties. Darren Lavery scored his third goal in as many games as Berwick beat 10-man Queen's Park. The home side were immediately on the front foot, and Ross Drummond's shot was well-saved by William Muir. It rebounded into the path of Blair Henderson who was poised to score before Scott Gibson handled the ball and sent off. Lavery made no mistake from the spot, sending Muir the wrong way to notch his fourth of the season. Come on Grambler! What is going on? Your predictions so far this season have been mince! You will have to buck your ideas up. All right, what have you got for us this week? Is that it? Well, it can’t be any worse than last week. Teaser time! Yay! Last week I asked you who was the top goalscorer at the 1966 World Cup. The answer is Portugal’s Eusebio da Silva Ferreira who scored 9 goals (5 more than that Geoff Hurst bloke got). One for this week. Who is the only player to have scored in the Glasgow, Merseyside and Manchester derbies? And finally, Cyril? 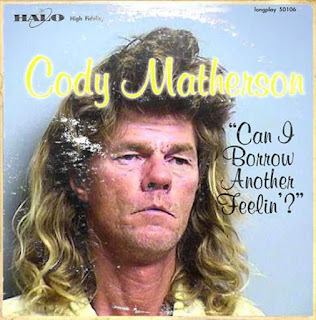 And finally Esther, I am indebted to a Mr C. Matherson who provides us with this week’s dodgy album cover. Scary man. Awful hair. Suspect title. Yay! A triple whammy.